Growing up, I remember many, many days coming home from school on a frosty day, to the delightful aroma of freshly made bread. The warm scent and cozy ambience left me with oodles of fond memories. Back then, my mother did everything by hand because she enjoyed it, and because bread machines were not invented yet. In fact, the first breadmaker was released in Japan in 1986, and now many companies, like Hamilton Beach have created their own versions. Loaf size – Choose 1.5 or 2.0 lb. Today, our hectic lifestyles demand easier and faster ways to make meals and baked goods without sacrificing flavor and texture. 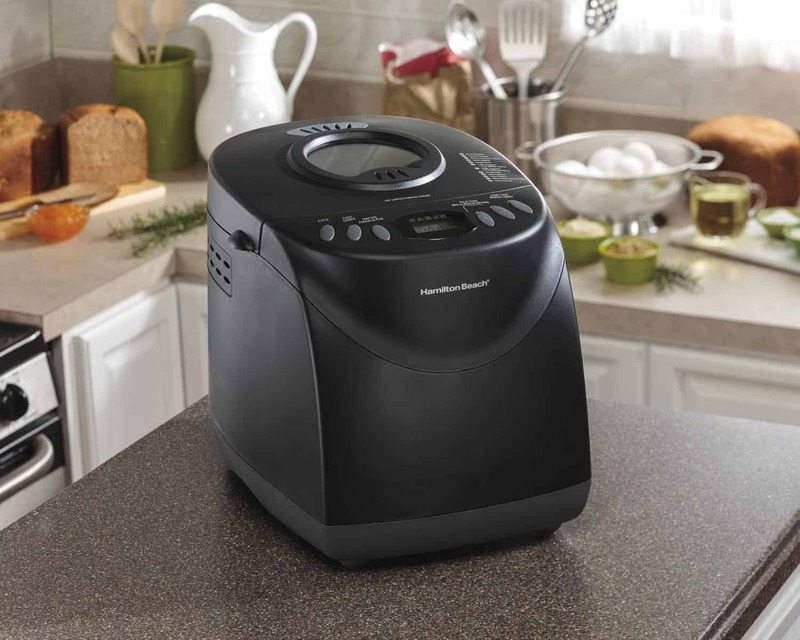 And, the Hamilton Beach Breadmaker offer this with it’s easy to use display and cycles. I’ve never used a bread machine before, so I was a little leery and unsure how my first attempt would turn out. There are various settings to choose from, so you get the right size, color, and texture you desire. But, you’re not limited to just making bread, you can also make sweet bread, cake, and pizza dough. My sister has had a bread machine for decades, so she came over and helped me create a few different recipes. We used various whole grain flours to see how the loaf would turn out. We created the French bread first, and I was amazed at how soft, moist and delicious it tasted. Then we made a whole grain bread and decided to toss in a few nuts and seeds. The machine automatically announced when it was time to add our nuts, and seeds, so we complied as instructed. Simple enough to make and our bread turned out great. Some of the kiddo’s in our family don’t like raisin, nuts, seeds, or veggies in the bread, so the good ole basic white bread is their favorite. Making pizza dough was super simple to make and we loved the texture. We also compared the prices and options on other bread machines and the Hamilton Beach Breadmaker is by far the best value. It has more options than more expensive brands and you just can’t beat the price. I would love the 3 in 1 Griddle!! Ooh, or the panini press! Would also like to have the 3-in-1 Grill Griddle. Another Hamilton Beach product I would love to have is the 3-in-1 Grill/Griddle. I would love to have the Easy Reach™ Digital Convection Oven. I would love to try the 3-in-1 griddle. I think this would be awesome for large family breakfasts and to use at the trailer. We’d love a Flip Belgian Waffle Baker with Removable Grids!! I like the Variable Temperature Indoor Grill with Panini Press (25324C). I would like the 3 in 1 Griddle. the 3-in1 Electric Spiralizer looks amazing! I would love to own the ChefPrep™ 8 Cup Food Processor. I’d love to have the 3-in-1 Grill/Griddle! I would love the spiralizer, I bet it would add interest to veggies for my kids! I could really use the Digital Steamer (37530C).My meals would be tastier and quicker. I would love to have the Variable Temperature Indoor Grill with Panini Press . 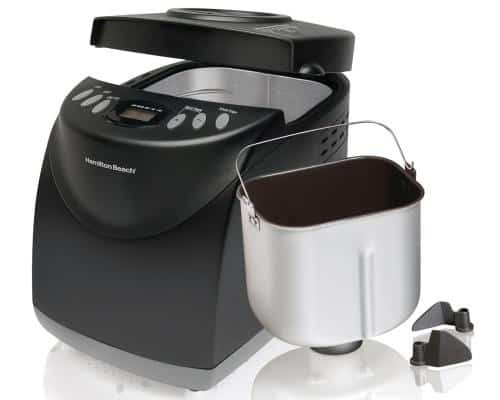 I love my Hamilton Beach products, I would love to add the breadmaker to my collection. I like the panini maker also. There are a few products I still need to make life in the kitchen easier. I have never used a breadmaker before, I always make m own with my hands, it is hard on the hands. I love the Programmable Set & Forget® 6 Quart Slow Cooker! I think I may just ask m husband for this for Christmas. I would also love to have the Dual Breakfast Sandwich Maker. Another Hamilton Beach product I would love to have the Easy Reach™ Digital Convection Oven. The Breadmaker…I love homemade bread. I could sure use an egg cooker, too. I would love to have the Classic Hand/Stand Mixer. I’d also love to have the Wave Power Plus 2 Speed Blender. I want the Hamilton Beach 14 cup Food Processor! I really need one of those! The 3 in 1 griddle would be my other choice. I would love to have a counter top oven. The 3 in 1 grill. Thank you for this giveaway. I would also love the 3-in-One Grill/Griddle . 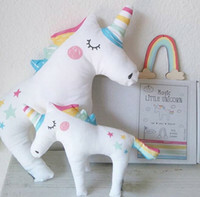 I bought it for my daughter a few years ago and she loves it! I would also like to have the 1.7 Litre Cordless Kettle with Adjustable Heat, would be great to have the perfect temp.! I would really like the 3 in 1 griddle! I would like to own the Hamilton Beach Ice Shaver. We enjoyed a lot of slurpees and slushies this summer and I would prefer to make our own healthier versions at home. This would be a win-win to allow the kids to indulge in icy treats without all the sugars, syrups and food colorings. I would like to try the 3-in1 Electric Spiralizer. I was just reading about the Spiralizers yesterday (September 24) and thought what a great idea to add more healthy foods to your diet in such a creative manner. The 3 in 1 Griddle would make making morning breakfast so much easier and faster! I’d like to try the 2-Way FlexBrew® Coffeemaker (49984C) I’m in the market for a new machine. I also like the Personal Creations blender. Thanks! I would love to have the Cappuccino & Espresso Maker! I’d love to have the 3-in1 Electric Spiralizer also. So many things I would love to have… to pick just one I think it would be the 3-in-1 Spiralizer. i love the 3in1 spiralizer. I’d love any one of the toaster ovens – mine only cooks on one side now. I would also love: Custom Grind Coffee Grinder (80370). I would love the spiralizer or a griddle. hmm both would be so helpful. Would love to have the 3 in 1 grill. I would love to add the Hamilton Countertop Oven with Convection & Rotisserie to my kitchen. I would like to have the Durathon™ Digital Iron with Retractable Cord (19902RC). I would like to have the Hamilton Beach 3-in1 Electric Spiralizer in my kitchen. That new 3-in-1 Spiralizer looks great! But seriously- a typo on their front page in the name of the product? (Sprializer) surprising! I would also like to have the TruCount™ Coffee Maker (45300C). I also would love to own the Flip Belgian Waffle Baker with Removable Grids (26030C). I would love to have the 1 Litre Stainless Steel Kettle. I love the 3 in 1 Griddle!! Thanks for the chance!!! I’d love to have the Countertop Oven with Convection & Rotisserie (31103C). I have wanted a waffle maker for so long! Ever since going gluten free I haven’t had good pancakes but I have had GF waffles at another person’s home. I’d want the Flip Belgian Waffle Baker with Removable Grids so I can again enjoy waffles. I’d love to have the Keep Warm 4 Slice Long Slot Toaster. The 3-in-one griddle is very interesting, I would like one! The Hamilton Counter Top Oven would be so handy for cooking- especially on hot summer days. I would love to have the Easy Reach™ Digital Convection Oven and the Belgian Style Waffle Baker. I would love the Digital Simplicity Deluxe 14-Cup Rice Cooker/Steamer to make perfect rice or fresh steamed vegetables. I wouldn’t mind having the 3-in-1 Grill/Griddle for breakfasts. I would love to have (and really NEED) the 14-cup Food Processor. My very old (40 year old) Iona Food Processor is on its last legs. 14 Cup Dicing Food Processor (70825C). The Dual Breakfast Sandwich Maker would be great! I would like to have the 3-in-One Grill/Griddle. I would really like to have the Sous Vide and 6 Qt. Slow Cooker (33970C). I would really like to have a 5-in-1 Indoor Grill. I would like to try the 3-in1 Electric Spiralizer (59998C). It looks like a fun gadget and it reminds me of an old-time TV product that I once saw. I’m positive HB has done a magnificent job on the 3-in1 Electric Spiralizer! would love to have the slow cooker. I would love to have the 14 cup food processor. There are many items I wish my kitchen was filled with from Hamilton Beach…but the one item that is definitely on my wish list is the 14 cup Food Processor. I’d love to start making some healthy bread at home. thanks so very much for the opportunity! Just this past weekend our waffle maker broke. We had it for most of our married life. Another product at Hamilton Beach that I would love to have is the Programmable Set & Forget® 6 Quart Slow Cooker . I want the Professional Style Deep Fryer. I love fried food and this would be a nice addition to my kitchen. I would love the 3 in 1 Grill Griddle. I would love the Slow Juicer (67950C). I’d love the Dual Breakfast Sandwich Maker. I would love the 3-in-1 Grill/Griddle! Would love to have one of the new Wave-Action blenders. I would really love the Quiet Blender. I could make good use of the 3-in-one grill/griddle. Ever since I heard about them I have wanted a Hamilton Beach 3-in-1 Electric Spiralizer (59998C). I would welcome the addition of the Quiet Blender . I would also love to have the breakfast sandwich maker. I want the Spiralizer so much. The 5 in 1 indoor grill would be great. I live in an apartment and can’t have an outdoor one. I would love to have the 1½ Quart Ice Cream Maker (68880C). My friend has one and makes the best ice cream ever. I would like to have a Belgian Style Waffle Baker (26020C). I would love to have the Dual Breakfast Sandwich Maker (25490C) for my hubby. He could make a nice breakfast each morning before work with it. I would love to have the Smoothie Start™ Blender (56222C). I would love to have one of the waffle makers – any one would do. It’s not practical but I’d like the Pizza Maker. I’d love the 3 in 1 grill griddle. I could use the Chef Prep 3 Cup Top Mounted Food Chopper. I would love to have the 14 Cup Dicing Food Processor! My breadmaker has broken down so I would love a new one… as for what “other” item would interest me… the 14 Cup Dicing Food Processor (70825C) Looks like it would make very short work of my cooking prep – which I currently do all by hand! I would also love the Quiet Blender (58870C)! I would love a 1½ Quart Ice Cream Maker. I’d love an HB 3-in-1 Grill/Griddle. I’m looking at the Hamilton Beach 8 Quart Slow Cooker (33184C) which would be very useful. I would also love the Dual Breakfast Sandwich maker! I would love the Searing Grill with Removable Plates. I don’t have a bread maker but I’ve used my sister’s and a friend’s bread maker. It was so easy and it was delicious!! A food chopper would fit right into my kitchen. I would like the Programmable Set & Forget® 6 Quart Slow Cooker (33967C). I think my ids would love anything made on the ” 3-in-1 Grill/Griddle.” they love their big breakfasts. I would also love to have the 90 Minute Garment Steamer. I’d like to have an ice cream maker. The Belgian Style Flip waffle maker would be awesome! My kids love waffles. I am fascinated by that motorized spiralizer. The sprizalizer. I love the idea of veggie nnoodles for salads and soups. I like the HB Spirilizer–it would be neat to try for beets or carrots. 3 in 1 Griddle please!!! I’m looking into buying one of the rice steamers! I also like the grill/griddle. As much as I’d love a slow cooker, I would love the Searing Grill with Viewing Window and Removable Plates even more. I would love to have that 3 in 1 electric spiralizer to make healthy meals for the whole family. It’s been so long since I’ve made bread, would love this to get back into baking. The three in one griddle would be very nice to have. I’d also love the food processor! I would love the 3 in 1 Griddle! Think of the possibilities… waffles, home made ice cream cones, potato waffles, zucchini waffles … endless options. I really would love a bread maker and it’s on my list. Moving back from Ireland a few months ago, I am now having to replace all my appliances due to the voltage differences. I’d love to have the Food Dehydrator! It’d be cool to make apple chips! i’d like to have the nutrifresh vacuum sealer! maybe santa will bring me a Belgian Style Flip waffle maker! I’d love to get the 3-in-1 Grill/Griddle. I would absolutely love to have the Cappuccino & Espresso Maker. I would love to replace my old popcorn popper with the Hot Oil Popcorn Popper ! Another product from Hamilton Beach I would like is the 3 in 1 spiralizer! The kids would love this! Brilliant prize eat a lot of bread in this house and often run out too so this would be ideal! I’d love to try the 3in1 spirilizer. I would really like to have one of their blenders-our leaks and does not work very well. I would love to try to dual breakfast sandwich maker or the 3-in-1 griddle. I’d love to have their 3-in-1 Grill. I’m always in the hunt for a good Food Processor. Stack & Snap™ 12 Cup Food Processor (70725C) is an Item I would be interested in. I have been craving espresso and the Cappuccino & Espresso Maker (40715) would be so nice to have right now. I would love to have the Pizza Maker. I do not have a bread maker so that is another product that I would really like to own. I would love to add the Hamilton Beach 1.7 Litre Glass Kettle to my kitchen!! I love the red 8 quart slow cooker. I’d love to have the Hamilton Beach Premiere Cookware Electric Griddle. I would love the Hamilton Beach Flip Belgian Waffle Baker with Removable Grids ! I would also like to have the Mess Free Belgian Style Waffle Maker. I would make some yummy breakfast with that! I would love the Hamilton Beach 3-in-1 Electric Spiralizer; I have been going through a food sensitivity issue and that means no pasta, so I have turned to zucchini noodles and this product would be perfect to make the process easier. I would love the Spiralizer. Id love to have the 6 Speed Hand Mixer with Case (62643C) so i didnt have to drag my stand mixer out for every little job! It would be fun to have the 3-in1 Electric Spiralizer. The 3-in1 Electric Spiralizer. I have been spiralizing everything by hand. We love veggie noodles. I would love to also get the Chef Prep™ 3 Cup Top Mounted Food Chopper (72705). I like Chef Prep™ 3 Cup Top Mounted Food Chopper . I would like the Countertop Oven with Convection & Rotisserie (31103C), so I can bake my cookies, brownies and pies faster! I would absolutely love the Quiet Blender, imagine the delicious drinks I could make. I really want a spiralizer! I love the 3-in-1 Grill/Griddle. The 3-in-one Griddle would be nice to have. I would like to have the Food Dehydrator. A cordless warming tray…so perfect for the buffet table hosting those large family gatherings. I would LOVE the Cappuccino & Espresso Maker!!! Would love to win the bread maker! I’ve been searching for a good Spiralizer and the Hamilton Beach 3-in1 Electric Spiralizer is awesome! It’s on my must have list! I definitely have the Quiet Blender on my Christmas wish list. I drink an insane amount of smoothies and my blender just bit the dust on me! The Deluxe Set & Forget® 6 Qt Slow Cooker (33862C) looks great! I need a new deep fryer. I was making catfish last night and my deep fryer thermostat stuck and all the grease boiled over in my kitchen. I would love a Panini Makers! Oooh I’ve heard so many things about Hamilton blenders! I’d love their Smoothie Start Blender (56222C) too! I would love to have is the 3-in-1 Grill/Griddle. I would love to have the Convection Oven. I would love the Hamilton Beach 3 in 1 spiralizer. I have been wanting one so long and have so many recipes I want to try it with. Maybe I could make some zucchini pasta with some homemade bread! I would love to have the 3-in-1 Grill/Griddle. I could use a new griddle! I would use the 3 in 1 griddle for every meal of the day, and the bread maker for my gluten free bread!! I would love to have the spiralizer. I love so many of your products but at the moment I NEED the 3-in-1 Grill/Griddle, mine has seen better days. The 3 in 1 Griddle would be awesome. Offers so many options I’d never expect from an electric griddle! I have used a breadmaker, but this one also makes cake! I would like to try the 3-in1 Electric Spiralizer. I’d like to have the Chrome Classic DrinkMaster Drink Mixer. I would love an ice cream maker. I would love to try the “Spiralizer” from “Hamilton Beach Canada” Thank You for the chance to win the breadmaker! I’d love the Food Dehydrator. I would love to try the 3-in-1 spiralizer. Would love to try their 1½ Quart Ice Cream Maker. You mean I can’t choose this? I seriously want a bread maker, haven’t had one in 18 years. Okay I am also interested in the 14 cup food processor. I really want a waffle maker but the 3-in-1 Griddler looks amazing! The 3 in 1 Griddle sounds great! I love making homemade bread! I was watching a cooking show that listed all kinds of styles of waffles and they all looked amazing. I’d love to have one of the Belgian Style Flip Waffle Makers! I’d like to try the Spiralizer. I’ve been seeing these spiraled squash veggie pastas on Pinterest and I’m dying to try it out! I really want to try to sprilize my foods. I would love to have the 3-in1 Electric Spiraliar for cooking healthy fake pastas. I would love to get the 3-in-1 Grill/Griddle. The ice cream maker would be a refreshing addition to my kitchen. I would love to have the Pizza Maker! I also like the spiralizer! I would love the Extra-Wide Slot 4 Slice Toaster! I would like the spiralizer. I would love to have their 3-in1 Electric Spiralizer. I really like my manual one, but it is sometimes a lot of work and it would be wonderful to have an electric one! Hamilton Bread Maker seems very versatile! Their Cappuccino & Espresso Maker looks awesome! That would be super nice to have when company comes over. I would love to have the Food Dehydrator. I like that this one has an adjustable thermometer and that it comes with a mesh sheet for drying fresh herbs. I would love to have a Juice Extractor.